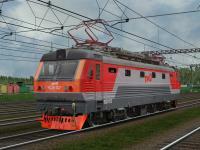 USING THIS ELECTRIC LOCOMOTIVE CHS2K ON ANY OTHER SITES WITHOUT PERMISSION OF AUTHORS AND ADMINISTRATORS IS PROHIBITED! ATTENTION! FOR CORRECT USING OF THIS ELECTRIC LOCO YOU NEED TO DOWNLOAD CABVIEW #1 FOR CHS2K AND SOUNDS #2 FOR CHS2 FROM THE SITE http://www.trainsim.ru ! This version works in both version of MSTS - with MSTS Bin patch and without one. ATTENTION! FOR CORRECT USING OF THIS ELECTRIC LOCO YOU NEED TO DOWNLOAD CABVIEW №1 FOR CHS2K AND SOUNDS FOR CHS2 VER. 2.1 OR NEWEST! This version of the cabin works in both version of MSTS - with MSTS Bin patch and without one.